MBK is a vast and always packed mall full of tiny stalls (2,500 of them, to be exact) selling, well, everything. MBK is a vast and always packed mall full of tiny stalls (2,500 of them, to be exact) selling, well, everything. 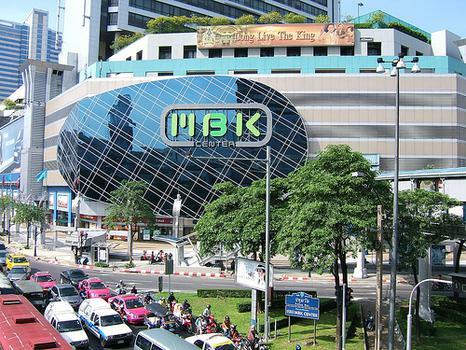 There's a heavy emphasis on clothing, especially the cheap and trendy teen type, but the fourth floor devoted to electronics is Bangkok's best place to buy a mobile phone, MP3 player, digital cameras, and much more. The fifth floor focuses on furniture in the rear, and electronics in the front, including a very large Canon store. Stuff on sale include gold, furniture, food, and a part of the sixth floor has been dedicated to handicrafts and souvenirs. Don't miss the dried fruits and Chinese-style snacks (like pork floss) at Champ on the fourth floor, near the central escalator. The top floor has film theatres and restaurants, and there's a large Tokyu department store bolted on the north side. It is possible to bargain for cheaper prices on some items at some independent shop stalls, especially if you are with a Thai friend or family member.